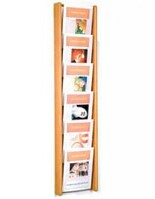 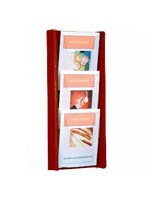 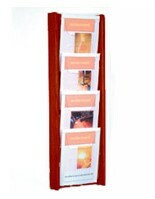 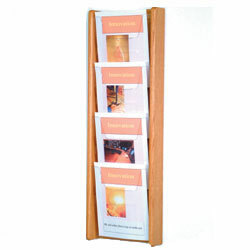 The hanging 4-pocket booklet rack is able to display several publications in one wall mount fixture. 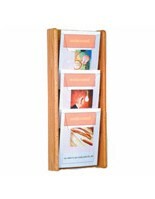 The magazine holder has a wooden back and sides with an acrylic front on each pocket to keep reading materials in place. 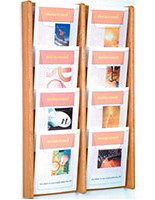 The booklet rack with tiered slots allows for easy viewing of information on display and with deep pockets more than just the title is visible. 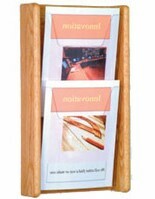 The magazine holder has a light oak finish that helps it to work in any kind of room décor. 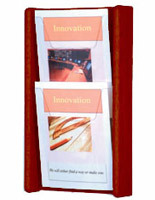 The rack has notches in the acrylic front panels that help customers or clients to easily reach the publications inside. 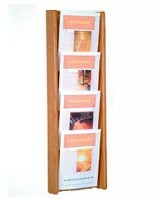 The slots in the flyer mount measure 9.5” across making it possible to hold many types of reading materials.